I think instead of having separate RED and GREEN worlds, we should instead apply the RED and Green rule-sets to individual server tiles/nodes. I realise this is has been suggested by many others and by the developers themselves, but I thought id expand on the idea. 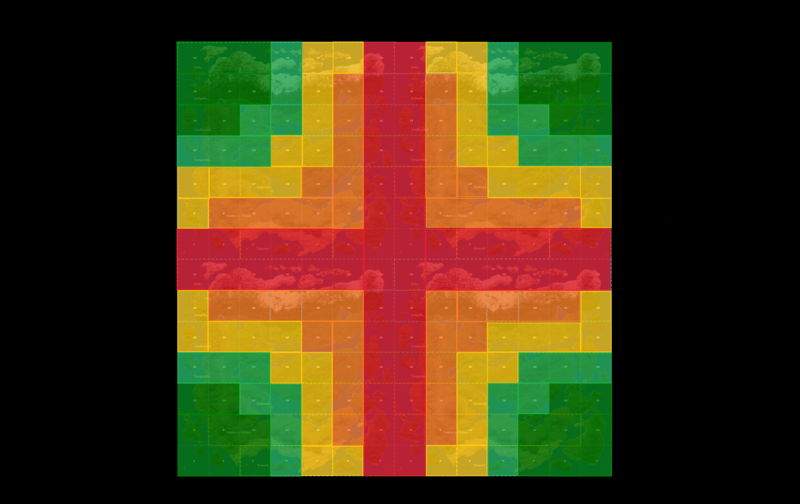 People often don't like the concept of having both Red and Green tiles in one server because what stops players from Red and Green building on the border of Red and Green and crossing over to suit there needs and abusing the system. (Storing all there goods in Green Tile Base on the border of the Red Server. The only difference between Green and Red worlds (aside from outpost restrictions) is the rule-sets. I think instead of just having Red and Green, their could be a gradual transition of server rule-sets as you move out from the centre of the world. I have only listed a few of the possible rules that could differ above. You would also have a YES/NO for town claim teleportation and you could include a YES/NO for things like bark-boxing as well. You could have many rules that differ from 1-5. Due to the vast distances between RED and GREEN, people from RED servers would be unlikely to interact directly with GREEN players and vice versa. They would indirectly interact through trade. 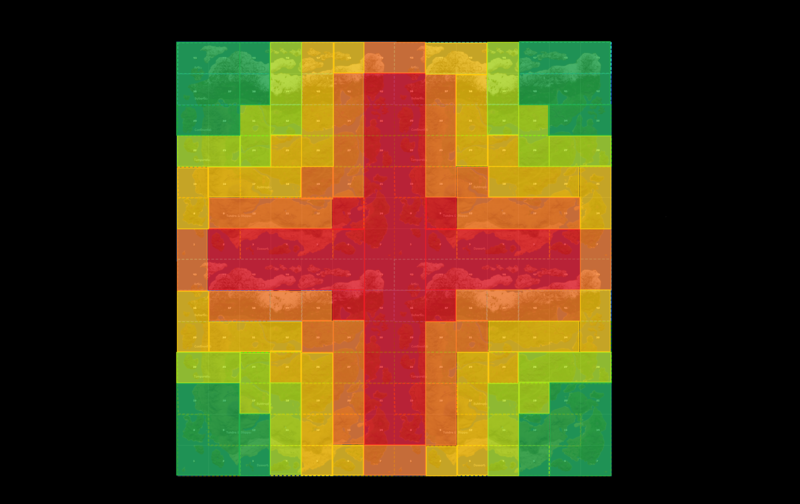 Players in Yellow servers would interact mostly with players from green and orange server nodes, and players living in orange servers will interact mostly with Red and Yellow servers. I think its important for Red servers to be in the middle, and the Green worlds on the edge. Players that want to PvP should not have to travel great distances to wage there wars. Solo players that just want to relax, build a small claim and trade can just head out to the far corners of the world and enjoy there lif in relative peace. What is everyone's thoughts on this suggestion? Like worg99, Nate884, Bunce and Monco likes this post. I very much like the idea of an integrated map, and the addition of several rulesets to combat the possibility of red/green abuse is excellent. 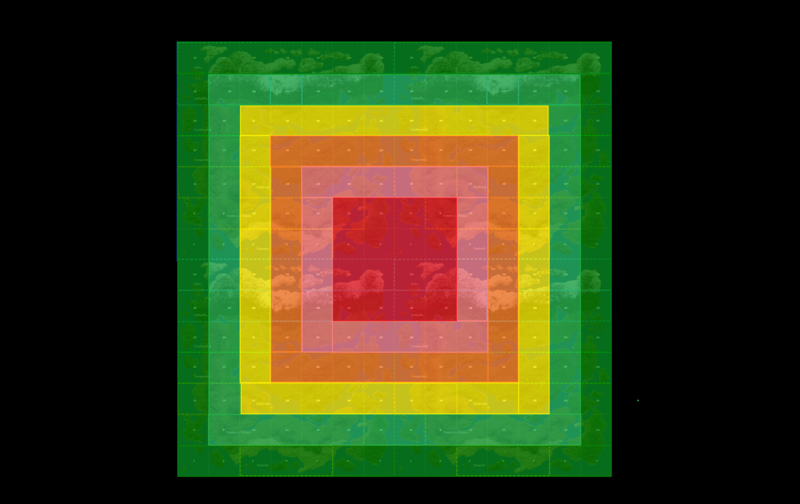 My only thought would be the possibility of a more random map layout: For instance, several red masses that fade out to green, to allow for areas of contention to be spread out a little more in the map. It could also allow ones to completely avoid traveling through red tiles though at great length and difficulty, and allow an appeal to cut through red to get to a nearby green or yellow server more quickly. Just some added variety as well as potential additional risk/benefit and trade routes. Perhaps you could even combine this suggestion with that of your military outpost ideas... the red servers are the seats of power, and the control extends out to the yellow/green servers surrounding it. The one that holds that red outpost collects the bonus income of surrounding high security tiles, thus still linking the green pve to the red pvp in overall interests and promoting the moving of peoples to either work together or resist. 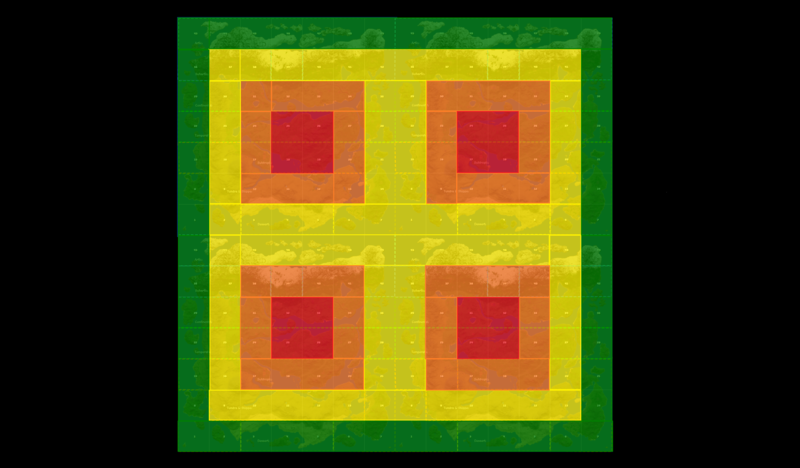 Imagine your military outpost map, but redefined with this color coding: The 'King' or overall control lies in a red server, as it moves out, there can be several orange outposts that pay taxes to red but collect from yellow, then smaller outposts in yellow for green. And green receives a small amount when the outpost above it is inhabited but can be taxed from that yield. It would then promote settling of green within each zone because that in the end truly determines the red's income. and it would promote teamwork/politics and diplomacy because you would want each outpost under you controlled by someone that will pay you taxes, thus creating a truly feudal system of kings, barons, peasants, each in their own way dependent on the other. and a greedy or ambitious guild, can attempt to make war with another red control server, attempting to bring two 'kingdoms' or lands under their control, or by setting up a guild there that is loyal to them... Thus creating living breathing kingdoms and politics that in some way affect even the pve players in green servers, while still not exposing them to the full raw pvp griefing and destruction. It could also encourage the green players to travel into the more dangerous zones, not just for crafting and trade, but to answer the call to fight and join armies without risking their little green farm and goods they wish to protect. I put some other possibilities together. There are many different ways you could do it depending on what you consider important. Yeah I guess they could work in well with the Land Administration System. I haven't thought about it much, and it would be complicated to merge them in the way you have described with all the rules in terms of only red can capture orange, only orange can capture yellow etc. But overall the idea could work. I understand better with pictures, maybe you could try to explain with a few basic drawings?